At 42 most cricketers have passed over half a decade in retirement and are either serving their cricket boards or television broadcasters. Especially these days when the riches of T20 leagues around the world have driven cricketers to retire even earlier. Misbah, however, is still playing. He is still batting. He is still captaining his country in the purest form of the game. Misbah, at 42, is scoring centuries and breaking records. His test average as a captain is 58.54; just a bit behind Hanif Mohammad's 58.73. But there aren't many captaincy records that Misbah will not hold by the time he hangs up his boots. When Misbah led Pakistan to a 15th test victory as captain, he broke the record for most test wins for a Pakistan captain, which was jointly held by Imran Khan and Javed Miandad. He now has 20 test wins. When Misbah scored his 2,409th run as captain in tests, he broke the record for most test runs as Pakistan captain, going past Imran Khan. Just a bit before that he had surpassed the runs tally of Inzamam Ul Haq and Javed Miandad as well. He now has a 1,000 more test runs as Pakistan captain than the next best. 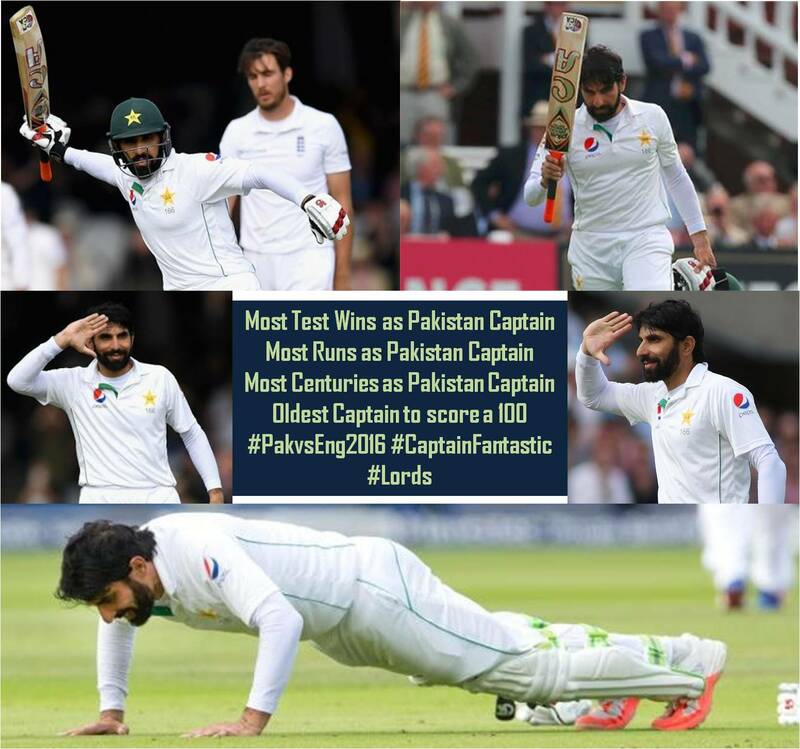 When Misbah scored a century at Lord's yesterday, his 8th as Pakistan captain, he broke the record for most centuries by a Pakistan captain, beating Inzamam's record of 7. Who knows how many he will end up with. The hundred at Lord's was really special considering it came in England, where many thought that Misbah will struggle. Like so many other times, Misbah stood tall and gave a fitting reply to all the skeptics. It was the first century by a Pakistan captain in England for 24 years with the last one scored by Javed Miandad in 1992! It was only the third century by a Pakistan captain at Lord's; the previous two were scored by Hanif Mohammad and Javed Burki. It was only the third instance of a Pakistan captain scoring a century in his first innings as captain in England; previously it was achieved by Hanif Mohammad and Javed Miandad. He became the oldest captain to score a test century, breaking Bob Simpson's record who had scored a ton at 41. It was already special when the day started with Misbah, at the twilight of his career, playing a test match and leading Pakistan for the first time in England; that too at Lord's. The fact that the day ended with Misbah's name forever engraved on the honors' board at Lord's is the stuff of dreams.